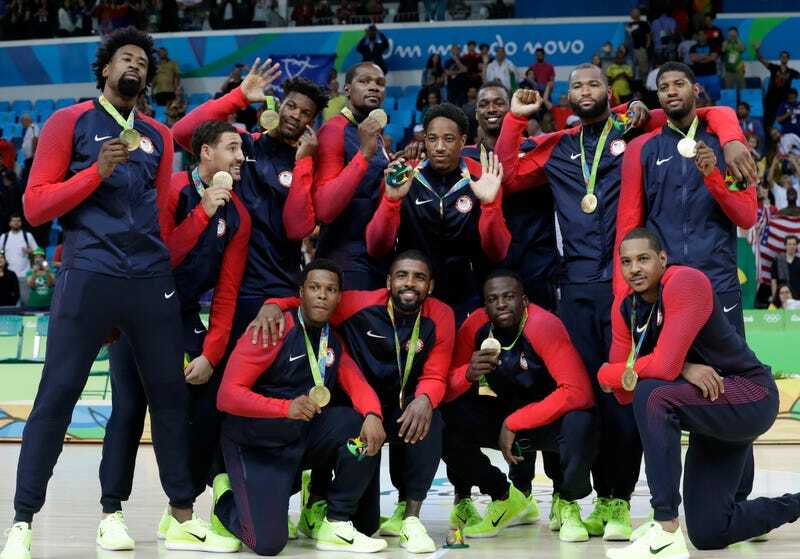 Jerry Colangelo Says USA Basketball Will Reign Until "Other Countries Get Their Acts Together"
For a team that won group play games by margins as slim as three, three, and six points, Team USA didn’t make this Olympic basketball tournament feel particularly dramatic. Polishing off Serbia 96-66 was the exclamation point on another dominant run through knockout play, and another gold medal, and another round of questioning what it’ll take to make this tournament more competitive. Jerry Colangelo doesn’t buy that any imbalance is the fault of the U.S. Colangelo was brought in by USA Basketball to fix things in the wake of the 2004 Olympic disaster, in which Team USA lost three games and settled for bronze. He was brought in to win, and that’s what he’s done, winning every FIBA tournament and putting up a 60-1 record. So, if you tell Colangelo that the USA has been too dominant at the Olympics, he’s going to tell you that’s not his problem. At the start of these Games, it looked like this ending was far from a given. Of Mike Krzyzewski’s 76 wins, in competition or exhibition, since taking over as Team USA head coach, three of them came in pool play: three-point squeakers over Serbia and France, and a six-point win over Spain. Ultimately, it looked like the U.S. just needed some game action to find their second gear. A flaw, to be sure, but not a fatal one. Even with those early tournament scares, Team USA swept its games with an average margin of victory of 22.5 points—a hair above the 2000 team’s 21.6 points, though well off the original Dream Team’s 43.8. As it shook out, Kevin Durant identified two separate units on the roster, even if they weren’t so segregated in practice. By “energy” he means guys a little more focused on defense and rebounding, and that unit shined in the final. The Serbs were held to 4-of-24 shooting from distance, and were outrebounded 53-34. It’s a sign of good team construction that the U.S. were able to win even when its big scorers’ shots weren’t falling, and at times throughout the tournament, nearly everyone had cold spells. But this team was built to weather those spells. Which brings us back to Colangelo, who makes no apologies for hoarding gold. He said he’d dig a truly wide-open field, but if that ever happens, it won’t be because Team USA has sunk to the world’s level.